The unmistakable buzz of a thousand children’s voices greeted us as we entered New York’s Hayden Planetarium in early June. My traveling companions could’t resist teasing me about taking them on a school field trip, and it’s true I’ve conducted many. Soon, however, they were studying the displays on the first floor until we hurried up the stairs with the crowd for the show in the main projection gallery. We wowed right along with the kids as we watched the simulated “big bang,” the emergence of galaxies, black holes, and dark matter clouding the universe. Afterwards we walked down the two-story spiral path punctuated with small lighted panels depicting events over the next 13.8 billion years—stars and then galaxy formations, protons and electrons, matter, water, DNA, bacteria, plants and animals and finally, at the ground floor, one last panel depicted the appearance of humans as the width of a single hair. My friends went slower and slower as we descended, reading each subsequent panel more intently. By the end, they were almost speechless in their wonderment. I remarked that the long walk was remarkably similar to the scope of Cosmic Education, the curriculum for elementary Montessori school. They looked at me with a mixture of curiosity and skepticism. I’m always surprised when friends and professional colleagues tell me they’ve never heard of a Montessori elementary curriculum, much less its name—Cosmic Education. It seems most people still associate Montessori with pre-school programs. In fact, the Montessori elementary program offers an integrated history/science/humanities curriculum aimed at stoking interests and providing a comprehensive framework for emerging intellects keen to grasp big ideas. Cosmic Education unfolds in the telling of sweeping stories–the Beginning of the Universe, the Emergence of Life on Earth, the Emergence of Humans, The Concept of Time, Great Civilizations, the Development of Language, the Story of Mathematics. Montessori guides (teachers) tell these stories repeatedly, adding further details and complexity as students mature in their understanding. My son Scott had the full complement of Cosmic Education lessons under the expert guidance of Betty Litsey, who attended the Montessori Institute for Elementary Teachers in Bergamo, Italy. Nearing the end of high school, Scott remarked that his school experience since Montessori had always been so easy because there was, in his mind, a place for everything to fit. When Bill Gates discovered a comparable curriculum for college students called “Big History” a few years ago, it appears he wished he had been furnished with a similarly broad perspective during his schooling. However, he thought, “Why wait until college?” He immediately sought out the Australian author David Christian and persuaded him to adapt Big History for high schoolers. Similar to Cosmic Education, the curriculum explores multiple perspectives of time and space beginning with the Big Bang, then the origins of life, Homo sapiens, the appearance of agriculture, and finally the forces that brought us into modern times. Compared to this sweeping scope, the typical high school course called world history was, in Gates’s opinion, a relic with little merit for understanding the world as we experience it. During this 2015-2016 school year, with Bill’s funding, the Big History curriculum is being piloted in 1200 high schools across the country. After adjustments are made, Gates promises that the Big History curriculum will be widely available. Educators at UCLA decided a decade ago that Middle Schoolers would benefit from a broader perspective, developing a similarly comprehensive curriculum called “World History for Us All.” Its lessons also begin with The Creation of the Universe, then move on to Early Humans, Migrations, Farming and Complex Societies, Exchange and Encounters, Empires, Global Convergence, and Modern Times. Peter Lee, one of the authors, emphasizes the importance of providing students with a framework for thinking by presenting a big picture quickly and then repeatedly coming back to it. The goal is to focus on large-scale patterns rather than simply isolated topics. The proposed frameworks, with objectives and complete guides to all the lessons, are at worldhistoryforusall.sdsu.edu. Montessori educators are convinced that younger learners also benefit from a broad perspective. Numerous research-based studies have found an immense capacity for learning between the ages of 6 and 12, one that seems to diminish as the teen brain activates. Elementary students are rapacious learners, keen to understand their world. With concepts in the process of formation, their minds are intellectually ready for a framework, a “big picture” of how it all goes together, creating context for further learning. For me, the big question is: Why isn’t Cosmic Education widely available? 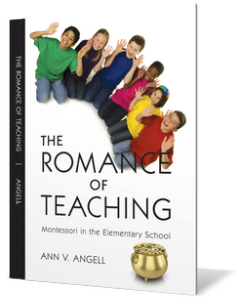 Why isn’t there a website or publications for all teachers of elementary students to access its premises, structural concepts, and story lessons? As Common Core and other mandated curricula threaten to obscure the learning landscape, it behooves us to find ways of offering young students wider avenues to learning, useful frameworks for developing their minds. Isn’t it time Montessori educators shared their resources?